After my hunt with Peat last weekend, in fairly deep snow, I was surprised to find a tiny tick on him. A month or so ago, after a short walk near the Boise River, I noticed at least a half-dozen tiny ticks inside one of his ears. We’ve never found ticks, until now, on the dogs after July 1st. I’m certainly no scientist, but I have to think that warmer temperatures are involved. Why would this matter to a chukar hunter? Maybe it doesn’t, but because of the diseases they carry I worry about ticks on my dogs. Ticks can carry Lyme Disease, Rocky Mountain Spotted Fever, and several other threats to dogs’ health. Even though the chances are low that ticks will carry one of those diseases, it’s a numbers game. After a short hike one spring, we once pulled more than 70 ticks off of Angus. And now that we’re starting to see ticks more or less year-round, the numbers are less in our favor. What can be done? I don’t know, other than putting Frontline or Advantix or another (expensive) tick preventative product on the dogs all year long. I’m wondering if anyone else out there is finding ticks at this time of year on their dogs. Lyme Disease & Climate Change: regardless of whether you think climate change is a hoax propagated by the Chinese, the numbers in this report by the EPA are alarming. Tick Population & Range Expansion: news article on increasing tick population and range. Tick Encounter Resource Center: Fascinating and very helpful resource from the University of Rhode Island. Deer Ticks are tough. Before Idaho I lived in Wisconsin where Lyme is a big problem. I know quite a few people that had contracted it one time or another and my neighbor across the street lost his dog to it. I’ve also seen them active in Wisconsin while there were still patches of snow on the ground. I live in Virginia and we have a Huge tick problem that persists year round. My dogs pick up ticks every month of the year. May and August are the times of heaviest infestation and I give the dogs frontline between the shoulders and hips. I also give them two months of NexGard (afoxolander) chewables to control ticks. The rest of the year I use Equi-spot horse applicator, reduced for dogs. My Vet approved the dosage and product use to lower my cost of controlling ticks and fleas. I buy the equi-spot from http://www.SmartPakEquine.com. It is administered the same as Frontline and effective for two weeks,as is Frontline (contrary to advertised effective four weeks). I get tick bites also so I tape my pants with duct tape to the top of my boots and spray down with repel which contains permethrin. My work keeps me afield all year: I hate ticks! Thanks for the great information, Ron. Sounds like quite a program you’ve got! Do you see any side-effects on your dogs from the treatments? Not yet Bob, but I worry about long term effects of applying chemicals to my dogs and me. My neighbor lost his dog to lymes disease this year. When I weigh the cost/benefit it always comes out to same conclusion: prevent ticks from being a vector of some serious disease. I’ve been using Frontline plus on my dogs, but it doesn’t seem to be as effective as it used to be. Nexgard may or may not be more effective. One of my dogs is allergic to flea bites, so I use Trifexis for him. Trifexis does not claim to control ticks. I recently switched my other dog to Interceptor plus, which is strictly for parasites and my vet suggested that I get a flea and tick collar for him. I think that Seresto is the collar that he recommends. I normally start my flea and tick treatment around the beginning of April. For myself, I start wearing Insect Shield socks when the ticks first start showing up and wear them until freezing weather, which was late November this year. I buy the socks that are factory treated rather than treating them myself. I believe that the factory treatment will last out the season while home treatment will only last a few launderings. I have Insect Shield T-shirts, but rarely wear them since most of the ticks that I find on me come up my legs. I will occasionally find ticks on my upper body in the spring. I wonder if some of the tick problem might be due to developing a resistance to the chemicals. If we have Round Up ready weeds, we could also have Frontline ready ticks. I also used to use the topical for ticks but I switched to Seresto collars after talking to Ann Jandernoa, who I would consider and expert on these matters, at Northwinds Enterprises . It takes a tick a day or more to transmit Lyme and any ticks I’ve found on my dogs a day or more after an outing are dead. Bob I grew up in Maryland and spent a several years employed outdoors as an archaeologist. I became overfamiliar with all sorts of nasties. Dogs can get Lyme disease, but only from a deer tick (the smaller ones). It is unlikely, however, that you all have Lyme in Idaho. For people most tick borne diseases don’t transfer unless the tick has been on you 36 hours. All of this is to say the best way to avoid any long term issues is a thorough tick check after a day in the field. Get the bugger off you/dog ASAP, put topical neosporene on the bite area, and if discoloration continues for more than a couple days start taking antibiotics. Ron has good suggestions for keeping them off in the first place. But always check after a field day. Thanks! I’ve gotten lots of great information, and yours is better news. We’re pretty vigilant about checking for ticks, but never during the cold months (until now). I seem to recall reading that Lyme is spreading; I need to check on this for Idaho. The expense of the preventing the possibility of one of the dogs tracking Lyme disease into your home is a good investment towards your own health. We know four people who have contracted Lyme Disease. Two of the them were long term illnesses with lots of pain, but they seem to be free now The third and forth are on going long term (multiple years) problems for both people. This is not something you want to deal with. The immediate point to make is that it does not matter what is causing the increase appearance of ticks. What does matter is that you need to do whatever it takes to keep the dogs free of ticks. The young boy (in his twenties) we know who has Lyme Disease is thirty plus pounds under weight and cannot be left alone. He has had it for several years and there is no prognosis it is going to go away anytime soon. The young girl who has it has been shipped all over the world to try to find a cure. No luck so far. Marla needs to deal with this issue because of living in the open area in Solvang. I am not sue what she does, but none of her dogs have fleas or ticks. There are large open spaces on two sides of her property. There certainly is a good opportunity for her dogs to pick up ticks in her yard. 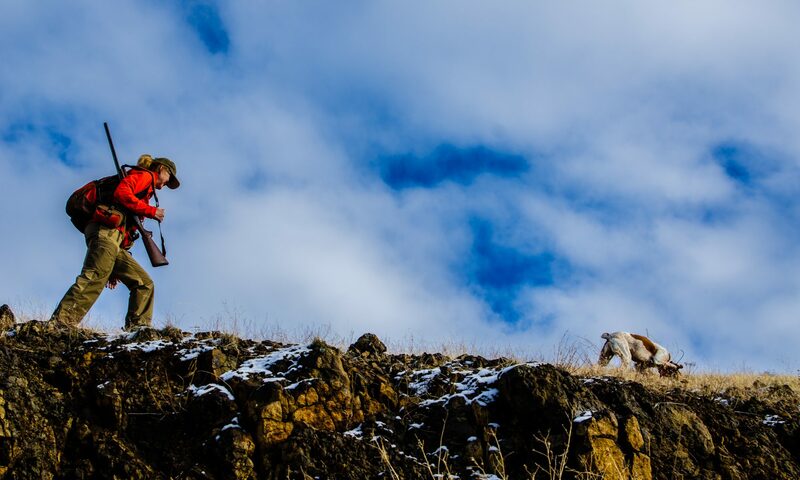 Hope I’m not of line asking this question here; but what brand of boots do you use, you consider the best so far for Chukar hunting in the type of terrain you hunt in? Kent, I’ve been planning a post on boots! In a nutshell, I use the stiffest, highest boots I can find, and they have to be Gore Tex. I’ll have more on this very soon. Thanks for the nudge. I was at my vet a few weeks ago and asked about tic prevention. He told me about Bravecto ( Fluralaner) 12 week flea and tick protection 1 chew. I plan on trying it this spring as I haven’t seen ticks on my dog this winter. I picked up a pamphlet about it . States it prevents flea infestations and kills ticks ( blac-legged tick, American dog tick, and brown dog tick) for 12 weeks also kills lone star ticks for 8 weeks. Don’t know if the deer tick is covered here or if it’s one mentioned. Cannot figure how to post pics on here or I would send you a pic of the product pamphlet. When my son and I hunted central Washington two years ago in late October we found two ticks on PePe. One was crawling ( (very small, probably a brown tick) and the other was attached above an eye and was fully engorged. I treated him with Frontline before coming down this year on 1 October and didn’t find anything in the two weeks we hunted in central and eastern Washington. Puncture vines along the Snake River drove us out of the chukar country (no shortage of birds) as they were so hard on PePe even with cordura boots. Scientists in Alaska believe we now have resident ticks in parts of the state resulting from the temperature norms increasing. Ticks promise to become an issue for us up here. Like your little hunting buddy, I broke my chukar curse this year too. Yakima and Clarkston are the general vicinities we hunted. This was a road trip that included a three-day visit with a cousin in Coeur d’ Alene and we had hoped to hunt south of there in Idaho. That didn’t happen because it was totally unfamiliar country and we headed back to Washington where we knew we would find birds. CDC tick distribution maps show the western blacklegged tick occurs in a small pocket in southeast Washington and it is possible that that is what the ticks we found on PePe were although I’m betting on brown ticks. Interestingly, the Washington Dept of Health website doesn’t mention the brown tick and CDC distribution maps show them US wide. Here is a link to a Yakima Hearld story predicting that 2016 would be a big year for ticks.